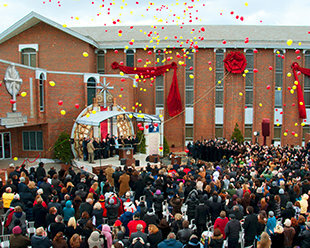 More than 1,000 Scientologists and guests attended the inauguration of the new Church of Scientology Greater Cincinnati on February 25, 2012. Mr. David Miscavige, Chairman of the Board Religious Technology Center and ecclesiastical leader of the Scientology religion, dedicated the new Church, which will serve the rapidly growing Scientology congregation in the Tri-state area. Dignitaries welcoming the new Church included Kentucky Governor Beshear’s Faith-Based Initiatives Executive Director, Mr. Colmon Elridge; Kentucky State Representative, Mr. Arnold Simpson; West Chester Trustee, Mr. George Lang; and National Underground Railroad Freedom Center Chairman, Reverend Damon Lynch. The Church of Scientology Greater Cincinnati celebrated the grand opening of its new Church in Florence, Kentucky. Scientologists, guests and state, county and city officials attended the dedication ceremony. The new Church of Scientology will not only provide services to its parishioners, but will extend the Church’s humanitarian initiatives and community outreach programs throughout the Ohio-Kentucky-Indiana Tri-state region. On Saturday, February 25, 2012, more than a thousand Scientologists and guests celebrated the grand opening of Greater Cincinnati’s new Church of Scientology Ideal Organization. The Church’s expansive new home stands on a three-acre campus at 283 Main Street in Florence, Kentucky. Celebrating in Tri-state style, dedication ceremonies for Greater Cincinnati’s new Church of Scientology Ideal Organization began with a performance of “We Shall Be Free,” performed by a gospel and country-bluegrass ensemble. Leading the inaugural ribbon cutting was Mr. David Miscavige, Chairman of the Board Religious Technology Center and ecclesiastical leader of the Scientology religion. Church officials and prominent parishioners from across the Ohio-Kentucky-Indiana Tri-state area joined Mr. Miscavige on stage to mark the historic expansion for the Church of Scientology in Greater Cincinnati. The Church welcomes visitors to its daily Open House. Tour hours are morning to night, seven days a week. The Church’s Public Information Center provides a complete introduction to Dianetics and Scientology, including the beliefs and practices of the religion and the humanitarian and community outreach programs Churches of Scientology sponsor. These include a global network of literacy and learning centers; worldwide drug education, prevention and rehabilitation; equally far-ranging human rights initiatives; and the Scientology Volunteer Minister program. Visitors are welcome to tour at their leisure and to return as often as they wish. The Grand Chapel has been meticulously restored and converted for use by the Scientology religion. It stands as the centerpiece of the newly opened Church, providing for all Scientology congregational services and ceremonies, including Sunday Service, Weddings and Naming Ceremonies. It further serves as a venue for gatherings of all faiths and community-wide events. The Grand Chapel will also serve as a venue for community gatherings of every type including seminars, workshops and a host of public events. The room can also be configured with banquet facilities for receptions and celebrations. A café adjoins the Public Information Center, and is open day and evening for those attending scheduled services or simply visiting the Church. The Church bookstore contains all of L. Ron Hubbard’s works on Dianetics and Scientology, available in 15 languages. In all, Mr. Hubbard’s legacy comprises tens of millions of published words and thousands of recorded lectures. The Church offers evening and weekend introductory seminars presenting fundamental principles of Dianetics and Scientology. Individual study rooms are devoted to the many introductory Dianetics and Scientology courses available at the Church—including Success Through Communication, which teaches the underlying skill to succeed in both work and social relationships. Introductory Scientology services offered at Greater Cincinnati’s Church include a full range of Life Improvement Courses that help to better any aspect of life, from personal integrity and relationships, to the raising of children, principles of prosperity and achieving one’s goals. The Purification Program was developed to free individuals from the mental and spiritual ill effects caused by drugs and toxins, through a regimen of exercise, sauna and nutrition—all of which are provided for in the Church’s Purification Center. The Hubbard Guidance Center waiting room for parishioners participating in Scientology spiritual counseling, known as auditing. Each of the dozens of auditing (spiritual counseling) rooms in the Greater Cincinnati Church provide the ideal, distraction-free environment necessary to achieve spiritual enlightenment. Greater Cincinnati’s Scientology Academy is where Scientologists train to become auditors (spiritual counselors). The Academy is comprised of multiple course rooms, each of which is devoted to a different aspect of training. As is traditional in all Churches of Scientology, the Office of L. Ron Hubbard stands in honor of the Founder and symbolizes that this Church is true to his writings and ideals. The Church of Scientology’s new home, a 50,000 square-foot church complex, stands on a three-acre campus in Florence, Kentucky. In addition to serving the growing Scientology congregation in the Tri-state area, it was further designed to serve as a gathering place for the greater community and a meeting ground for people of all denominations to work together for the betterment of all. The Church of Scientology Greater Cincinnati celebrated the opening of its expansive new home Saturday, February 25. The inauguration was attended by more than a thousand Scientologists and state, county and city officials. 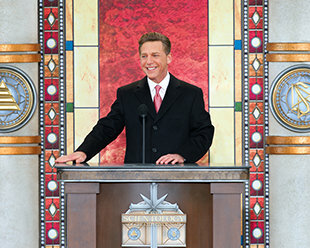 Mr. David Miscavige, Chairman of the Board Religious Technology Center and ecclesiastical leader of the Scientology religion, dedicated Greater Cincinnati’s new Church of Scientology. Located in Florence, Kentucky, within the Cincinnati-Northern Kentucky metropolitan area, the Church’s new home stands at the intersection of Dixie Highway and Union Pike, the junction that inspired Florence’s original name of “Crossroads.” The new facility will not only provide Scientology services to parishioners, but will extend the Church’s humanitarian programs throughout the Ohio-Kentucky-Indiana Tri-state region. Welcoming the new Church were Kentucky State Representative, Mr. Arnold Simpson; Kentucky Governor Beshear’s Faith-Based Initiatives Executive Director, Mr. Colmon Elridge; National Underground Railroad Freedom Center Chairman of the Board, Reverend Damon Lynch; and West Chester Trustee, Mr. George Lang. The new Ideal Church of Scientology of Greater Cincinnati measures 50,000 square feet and stands on a three-acre campus. In addition to its Grand Chapel for all congregational gatherings, Sunday Services and religious ceremonies, the Church further includes multiple seminar rooms and classrooms, as well as dozens of rooms for Scientology auditing (spiritual counseling). The Church welcomes all visitors and those wishing to find out about Scientology for themselves. Directly adjoining reception is an expansive Public Information Center, providing a complete introduction to the beliefs and practices of the Scientology religion, as well as the life and legacy of Scientology Founder L. Ron Hubbard. The Information Center additionally presents a detailed overview of Church-sponsored humanitarian programs, including a worldwide human rights initiative; an equally far-ranging drug education, prevention and rehabilitation program; a global network of literacy and learning centers; and the Scientology Volunteer Minister program now comprising the largest independent relief force on Earth. In full, the Information Center’s multimedia displays offer some 500 informational and documentary films at the touch of a button. The Center is open morning to night and visitors are invited to tour at their leisure and return as often as they wish. The Church’s Grand Chapel will also be open for interfaith and community events in service to the Greater Cincinnati area. The Church of Scientology Greater Cincinnati is the third Ideal Organization (Org) to open in 2012, joining the Church of Scientology Sacramento, opened January 28, 2012, in California’s capital; and the Church of Scientology Hamburg, Germany, opened January 21, 2012. Other new Churches opened in recent years include Minneapolis-St. Paul, Minnesota; New York, New York; Washington, D.C.; Tampa, Florida; Nashville, Tennessee; Seattle, Washington; Las Vegas, Nevada; Los Angeles, California; Pasadena, California; Inglewood, California; as well as Québec City, Canada; Mexico City, Mexico; London, England; Melbourne, Australia; Brussels, Belgium; Madrid, Spain; Rome, Italy; Berlin, Germany; and Moscow, Russia. More than 10 new Ideal Orgs are further scheduled for grand opening in 2012.